As you know tonneau covers have become a very popular truck accessory in the past ten years or so. They are very user friendly and there are many different styles available to suit your needs. Say that you need to transport a pressure washer in the bed of your pickup truck, but the pressure washer is too tall to fit underneath. This used to be a major problem for trucks with tonneau covers on them, but not anymore. The tonneau cover market now has several sectionalized covers to choose from. This allows you to fold up the sections that would interfere with the pressure washer (or whatever oversized items) and even travel down the road at highway speeds with them in this position. These tonneau covers mount onto either the top of the bed rails or in between the bed rails. This works perfectly with the DualLiners under the rail design. Some bedliners are an “over the rail” type of application and you could have a problem installing a tonneau cover with those types of bed liners. If you plan on purchasing a DualLiner before you order a tonneau cover then it is a huge benefit to know that the DualLiner works great with all the major brands. The custom fit panels are designed specifically to follow the contour of each different make and model of truck. To install the side panels you first need to insert the top of the panel underneath the bed rail. Then you push the bottom of the panel tight against the sheet metal. Located at the bottom of the sidewall panels is a “C” channel, this channel is what holds the zero skid bed mat in place. The zero skid bed mat does an excellent job of preventing your cargo from shifting. The properties of the zero skid bed mat make it the perfect material for absorbing impacts and preventing dents in the sheet metal. This system provides complete protection for the sidewalls, tailgate, and the bed of your truck. Tonneau covers work great with the DualLiner. The cargo you haul in the back of you truck will not be sliding all over and you have added security with a lockable tonneau cover. They also make your truck yours and it is going to look better longer with these important accessories. 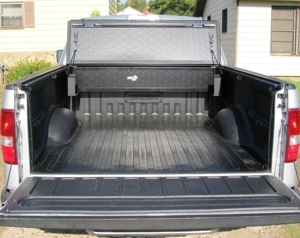 Both tonneau covers and bedliners are great ways to increase your trucks resale value as well.